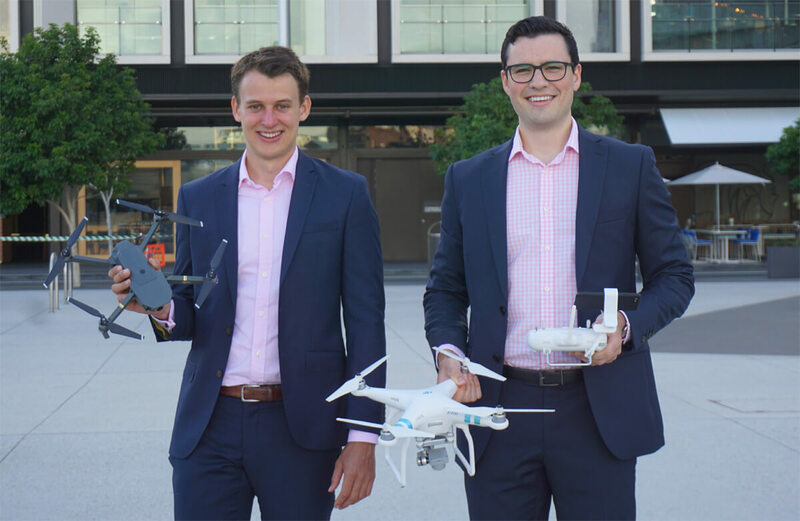 How two Graduates, Fraser McTavish and Anthony Fisher, have turned a shared passion for drone technology into new career opportunities within Financial Assurance. Mates Fraser McTavish and Anthony Fisher met at uni while undertaking respective degrees in commerce. It just so happened that when they finished their studies they both coincidentally accepted Graduate roles with us, in the very same team – Financial Assurance. Sharing a mutual passion for drone technology, the duo have since helped spearhead an innovative drive to harness these devices and create new value for our clients. “With a passion for drones and the widespread commercial impact of this innovative technology, we stepped out to explore where this could take us. With the support of the teams across PwC, we are now leading the charge in exploring how our client’s business can realise efficiencies, cost savings and new opportunities through implementing drone technology,” says Fraser. The now ‘Drone Team’ helps a range of clients implement drones into their business operations. So far, these opportunities have been realised in the agricultural space and industrial manufacturing, with the team continuing to develop the offering so that it can extend to more lines of service. However, not all new technologies are bringing excitement to our industry. Automation has induced growing concern over whether it will negatively impact jobs, or worse – make them obsolete. But instead of buying into the hype, Fraser and Anthony have redirected their energies into embracing the new opportunities these advancements can bring. “Don’t be concerned about how technology is changing your industry – be excited! When industries are fluid and undergoing change there are new opportunities created for you to lead the charge and drive the industry to where you want it to be. Identify where the changes are taking place and be ready to capitalise on them,” says Anthony. “As a Graduate, it’s easy to get worried about the impact of automation on your job prospects. Rather than thinking about how automation can impact you, think about how you can drive change and bring creative solutions to the table to drive efficiencies within key business processes,” adds Fraser. To seize these new offerings you need to be in an environment that encourages you to innovate and support you in the process. For Anthony and Fraser, they found it was the reinforcement they received from their team and mentors that allowed them to turn a shared passion into something more meaningful. “What’s surprised me most about PwC is the weight everyone’s voice and opinion carries within the team. Whether you are a Partner who has been with the firm for 30 years or a new Graduate who has been with the firm for less than a year, everyone’s voice, opinion, and ideas are taken on board to help our clients,” Fraser says. The exploration of passions aren’t just limited to client work either! Aviation enthusiast Anthony has been able to pursue his goal of obtaining a Private Pilot License, thanks to the work flexibility needed to make it happen. “I am passionate about aviation, and since starting full-time work at PwC have been able to obtain my Private Pilot Licence. The dates of flight training, flight tests and examinations are often inflexible and weather dependent. The support PwC provides its staff through flexible working arrangements was crucial to completing my flight training,” he says. So, regardless of where you join make sure it’s somewhere that adds to the momentum you need to reach new heights!